Cyber Monday US deals: Get a PS4 Pro 1TB with The Last of Us Remastered and Ratchet and Clank for $399. No, I’m not joking. Finding the newly-released PS4 Pro at a reasonable price is tricky to say the least, even on Cyber Monday. But what would you say if I told you you could get a 1TB PS4 Pro with two free games? These aren’t any old games either - they’re The Last of Us Remastered and Ratchet and Clank. View deal: PS4 Pro 1TB with The Last of Us Remastered and Ratchet and Clank for $399 at Gamestop. 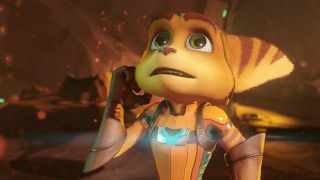 In case you need reminding how great both of these games were, we loved Ratchet and Clank as it’s "a thoroughly enjoyable reboot for the widely adored duo, improving on the PS2 original in every way while staying totally accessible for newcomers". The Last of Us Remastered has a special place in GR+’s heart too. Not only did it get five stars, as "after years of bold claims from multiple parties, it could be argued that The Last of Us is the first truly mature interactive narrative in the action genre. As such, it’s a genuine landmark, and an utterly fitting representation of the seventh console generation's last chapter". If you’re still nonplussed, take a look at our best Cyber Monday gaming deals if this bargain doesn’t quite tickle your fancy.